These hand manikins make it easy to practice drawing or painting hands in a variety of positions. Looking for a reference tool in drawing or sketching human figures? Richeson Hand Manikins serve as a valuable reference tool for any artist. Both right and left, female and male hands are available, so you can choose the best option for your project. Each manikin is crafted from carefully smoothed, beautiful natural wood. Fingers hinge just as joints would naturally bend, so you'll enjoy a lifelike replication of real hand positioning. For years, artists have struggled to capture the expression of human hands. These life-sized models (11.5 inches from wrist to fingertip) make it easier to get every line just right. Whether you're just beginning to take up drawing human figures or you're an experienced pro just wanting to complete a familiar task a bit differently, give these hands a chance to make your art come to life! 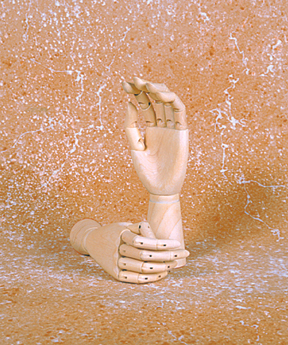 Hand Manikins by The Jack Richeson Company Beautiful hand manikin 11.5 inches in size. Right and Left, Female and Male. Made of Natural Wood. Capturing and rendering the gesture and articulation of the human hand is one of the most challenging problems that an artist can master. Make it easier with these life size models. 3.8 out of 5, Based on 6 Reviews. Great hands . Excellent quality.Very flexible . Like the size and qulity..but a little dismayed that thumb does not really extend very much. Fingers do very well, and if looking for model to assist with drawing, these are very nice. I originally wanted to have hands hold something, but I am not sure that will be able to fit, due to thumb. these manikin hands are very useful and affordable. the only difference is the thumb does not fully extend. Serves the need they were designed for perfectly. Excellent quality and value. Excellent quality and value. Serving the purpose they were designed for perfectly. My problem is not with the model but with the description. These are not life size manikins. The hands are long enough but the wrist is very tiny, only about 4 inches around. The description is deceiving and I never would have purchased them if I knew the wrist dimension.